Abidjan (AFP) - Ivory Coast summoned the French ambassador Tuesday in a diplomatic row over moves by a Paris judge to interrogate the country's parliamentary speaker, former rebel chief Guillaume Soro. Foreign Minister Charles Koffi Diby told AFP that he was voicing "a strong protest" against a warrant to question Soro in connection with a complaint filed by Michel Gbagbo, son of former Ivorian president Laurent Gbagbo who is currently awaiting trial in The Hague. "The parliament speaker is on an official mission" on behalf of the president and has "absolute immunity", said Koffi Diby, calling for the summons to be annulled. Soro travelled to Paris to attend the COP21 UN climate conference. It was impossible to immediately confirm whether he was still in France. Several hours later, Soro's lawyers issued a statement saying the summons was not applicable because of his diplomatic immunity. "Documents proving the official nature of his presence in France for COP21" were shown to the investigating magistrate who had issued the summons on Monday, Soro's legal team said. They said the investigating magistrate had acknowledged that Soro "holds diplomatic status, and the immunity" that goes with that, indicating that the summons was not applicable. The magistrate had sought to question Soro in connection with a complaint linked to "kidnapping, isolation and inhuman treatment" in 2012, when Soro was prime minister, several sources said. She had issued the summons because he had not responded to earlier requests to respond. Soro's lawyers protested over the move, saying it had been issued "in disregard of recognised and known diplomatic practice and procedure". 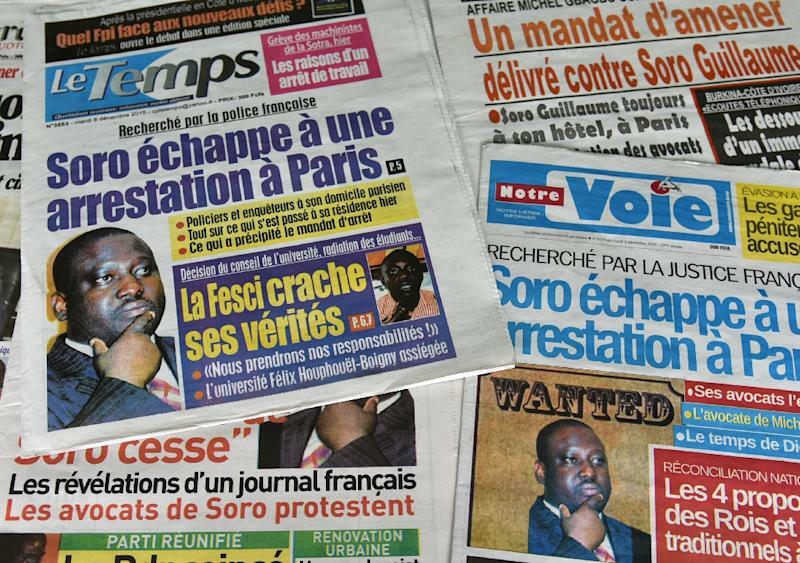 One source close to the investigation who asked not to be identified said police had gone to Soro's Paris home on Monday but he was not there. His lawyers said they would file a complaint against Michel Gbagbo for libel. Soro headed rebels fighting Gbagbo, who was ousted after refusing to concede defeat to his arch-rival Alassane Ouattara in 2010 presidential elections. After weeks of violence, Gbagbo was arrested in April 2011 when Ouattara's forces, backed by the United Nations and France, overran his compound in Abidjan.